One forecaster got it right last winter, and the others did not. But who will be right this winter...? Last year in this issue, when reporting on the late-October "What Will Winter Be Like" forecast-palooza hosted by the Portland Branch of the American Meteorological Society and by OMSI – which again this year hosted the event in its auditorium on October 27th – we reported a sharp divergence between the forecasters. 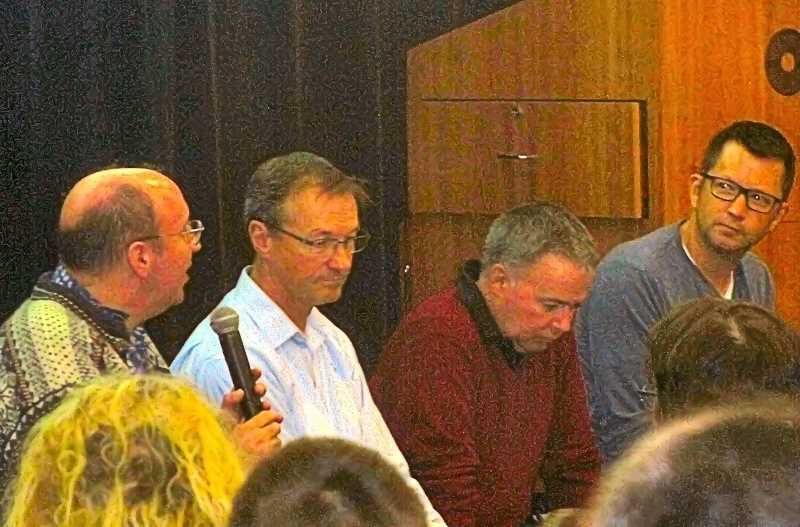 In fact, the sharpest we can recall in our many years of attending this annual public meeting. A year ago, other forecasters were generally predicting a repeat of the sometimes-snowy, cold and wet winter of 2017 once again in 2018, but KGW-TV forecaster Rod Hill – saying that he uses the same method they did, of using "similar years" winter patterns, but he adds one more factor – disagreed with them. He had gone on to look up the kind of winters Portland had experienced following a summer such as we'd had in 2017, and he found those were always warmer and drier winters than usual. So he forecast a relatively dry water year in Portland – right around 30 inches for the year – and not much snow here, together with a warmer winter. And he was the one who'd turned out to be right; in fact the Portland Airport recorded almost exactly 30 inches for the water year just past! But he conceded he did not foresee the VERY warm January we had this year, and like all the other forecasters a year ago, he expected it to be a normal snow year in the ski areas, and it was disappointing instead. So it was, this year, at 10 a.m. on October 27 in the Oregon Museum of Science and Industry's auditorium just north of the Ross Island Bridge, that the same three featured forecasters stepped up to make their new forecasts for the coming winter – going into considerable illustrated detail on their methods, and showing what they took into consideration in reaching their conclusions. First once again was Tyree Wilde, Meterologist for the National Weather Service in Portland. The NWS forecasts primarily based upon computer models, water temperature trends in the equatorial Pacific, and prior year patterns. Wilde expects the weather pattern this winter to switch from last winter's "La Nina" to a "weak El Nino", although at the moment it is ENSO neutral, he said – and so he expects above normal temperatures and generally below normal rain in the first half of the winter, rising to normal in the second half. The mountain snowpack will be "a little below average", he thinks. Second to present was Rod Hill, who celebrated a little for his correct but divergent forecast last year, since nobody else had noted it, but went on to forecast a winter this year not much different from Wilde's: A bit warmer winter, a bit more rain than this past year (he now expects 35-40" for the full new water year), but not much snow in the Portland area, and maybe one wind event. He remarked that we had not had an "Arctic Express" in several winters, but is not specifically predicting one this year. As for the ski areas? Alas, even worse than last year, says Rod: Maybe 66% of normal snowpack. Last to forecast was Kyle Dittmer, Hydrologist/Meteorologist for the Columbia River Intertribal Fishing Council, whose forecast for the winter of 2017 was the one that was most correct. He agreed that the emerging pattern in the equatorial Pacific resembles a weak El Nino developing, but he pointed out that sunspot activity has an established effect on Earth's weather, and our current sunspot minimum had gone for 174 days, as of the date of this conference, with absolutely no sunspots at all. This factor, he said, means to him that instead of a weak El Nino the weather pattern instead would be ENSO Neutral, a time when Portland experiences a variety of unusual and unexpected weather events from time to time. Therefore, his prediction is that temperatures this winter will be near normal – maybe slightly warmer than usual in January – and rain will be "near normal" through January and then slightly less than normal starting in February. He expects a season total of 5.5" of snow in the Portland metro area, in three snow events, two of them minor. For skiiers, Dittmer holds out hope – he thinks there will be good snow in the mountains, especially in the spring. 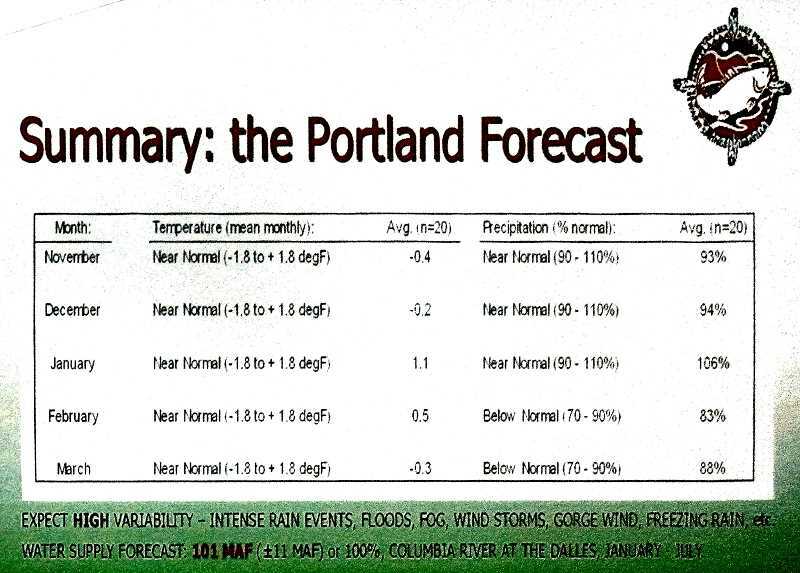 Most interesting, he expects "high variability" in the weather in Portland during the winter, while the other two thought it might be a fairly bland season. Among the sort of events he envisions are "intense rain, floods, fog, windstorms, gorge wind, freezing rain, etc." But just now and then, you understand – he does not expect the apocalypse! So, who will be right? In a few months we'll know. In the meantime, don't forget to steer in the direction of a skid to regain control; and watch out for pedestrians, bicyclists, motorcyclists, as well as motorized kids' scooters carrying adults (who would have guessed!) – whose riders are invariably not wearing the required helmets.